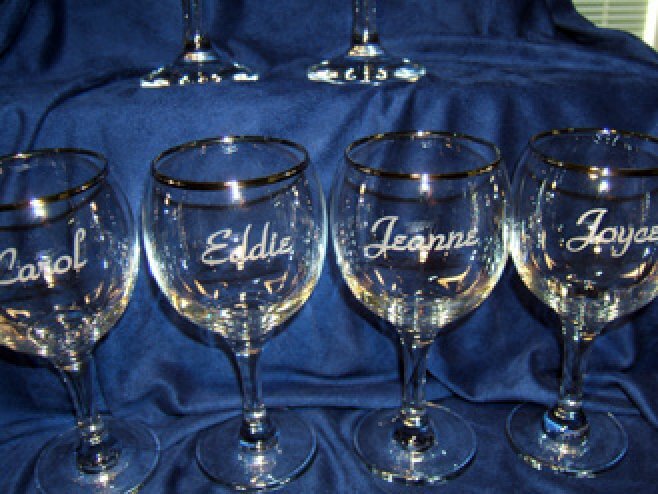 Get a custom etched item for those special occasions. Etching is a unique way of making your glassware or marble piece personal. An example is two champagne glasses with a bride and grooms name and/or date on them. We offer a variety of glassware, marble items, and porcelain items that you can purchase and have them personlized for your special occasion or event. We also offer a few pre-etched items. We have numerous items on display throughout our store. If you are intrested in any or are intrested in other glassware we offer, we insist you email us at hjdquote@att.net.